With limited time but great desire to witness some highlights of Vietnam, what else you expect? Indochina Travel Service can help to make your wish come true. This is an intense trip producing an overview of Vietnam's cultural diversity and natural beauty. 10days Vietnam touring shows you the Old Quarter, Halong Bay (in the North), Hue Royal City, Hoi An (in the Central) and Mekong Delta (in the South). Upon arrival at Hanoi’s Noi Bai Airport, the guide of Indochina Travel Service will welcome you and transfer you to your hotel in Hanoi. You are free to stroll around the city and catch a first glimpse of this peaceful city. In the evening, a dinner out to taste local authentic Vietnamese Cuisine, followed by the water puppet show – a fantastic art form, unique to Vietnam and best seen in Hanoi. At 8am, start the day with a visit to Ho Chi Minh’s Mausoleum and “House on stilt” at the same area with the Presidential Palace and the famous One Pillar Pagoda. We also make a visit to the Temple of Literature – the first university of Vietnam, which is now dedicated to Confucian worship and “Hanoi Hilton” –a nick name given by US pilots during the war. There is time to visit Hanoi Old Quarter and Hoan Kiem Lake with a stop over at Ngoc Son Temple. Rest of the time, you can explore further on your own. You could stroll around the French quarter where many of the embassies are located. Or take a shopping expedition in the Old Quarter or just relax at one of the many parks and lakes that make Hanoi one of the greenest cities in Asia. In the morning, you will be picked up at your hotel and transfered to Halong Bay, about 170 km east of Hanoi (approximately 3 hours). Upon arrival, you will embark on a traditional wooden Junk for the beautiful cruise on the world heritage site - Halong Bay. You will enjoy a delicious seafood lunch served on board; then it is your pleasure time for swimming and sunbathing. In the evening, you will have dinner on board whistle watching sunset. Tonight, you will experience memorable overnight on board. This day you will have further cruise on the bay, visit rock piles and sun bathing before getting back to the wharf in the early afternoon. Our waiting vehicle will transfer you straight to the airport for the flight to Hue. Overnight in Hue. We start our day with guided touring around the Imperial Citadel, visiting the Noon Gate and Forbidden City; then followed with the Antiquity Museum for some view. After that, we will drive out Hue outskirt to visit Khai Dinh Royal Tomb. If time allowed, we can stroll around at Dong Ba Market. Afternoon free at leisure. Overnight in Hue. After breakfast, we will take a drive to Hoi An. On the way, you will stop over Hai Van Pass for nice photos. Arriving in Hoi An, we check in hotel, enjoy lunch and then start a walking tour through the Ancient Town. Here we can see the vestige of the mix combination of Chinese and Japanese architecture as well as traditional cultural values. 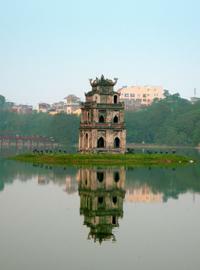 In December, 1999 Hoi An is declared a Unesco World Heritage site. We will discover by ourselves interesting proper character. Overnight in Hoi An. Free day for your own activities. You can get a wardrobe of clothes tailor made, relax at a cafe by the river front or hire a bicycle and venture out to the countryside or Cua Dai beach. Free time until a transfer to Danang Airport for flight to Saigon. Upon arrival in Tan Son Nhat airport, transfer downtown and check-in at your hotel. You will have leisure time to explore the city. This metropolis, contradiction of its northern counterpart, is crowded with bikes and motorbikes, excited by numerous shopping areas and sidewalk cafe. Overnight in Saigon. The Mekong Delta is an area where boats are still the main means of transport and where rice paddies stretch as far as the eye can see. A pick up at hotel for approximately 2 hour journey to Mekong Area. Today, you will visit a fruit garden, taste fresh fruits and discover local culinary specialties, especially Deep Fried Elephant Ear Fish and spring rolls. For those who love to explore the culture of the wet rice civilization, the Mekong Delta is really an unforgettable experience. We get back Saigon at around 6 hours. Trip concludes after a drop off at the airport for the flight home. End of services by Indochina Travel Service.